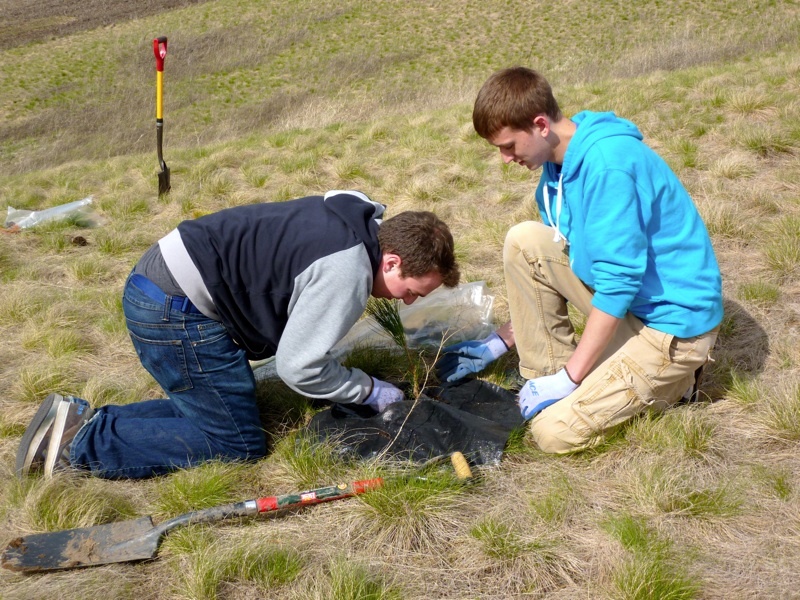 WSU students Nick Krehoff (left) and Jared Thompson, planting native ponderosa pine trees in the Earth Day / Arbor Day event in the WSU Arboretum and Wildlife Conservation Center, April 22, 2011. Any day that you can plant a tree that might live to be 300 – 500+ years old is a good day. And when you plant that tree on Earth Day or Arbor Day in the WSU Arboretum and Wildlife Conservation Center, it’s even better. 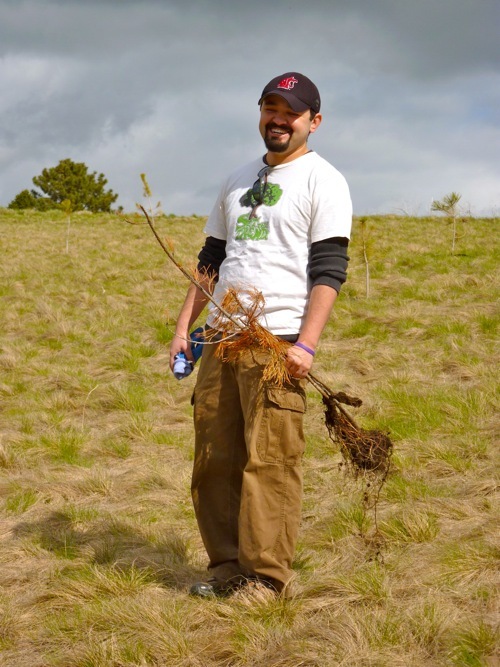 We want to thank the members and friends of Beta Theta Pi who spent part of an afternoon on Earth Day, 2011, in the WSU Arboretum, helping staff replant about 40 small ponderosa pine trees that were lost to the hard winter. In addition to replanting trees on the exposed, upper ridge line of the arboretum, students participated in a “scavenger hunt” for rocks, to clear a grass field that will be mowed several times this summer. The WSU Arboretum and Wildlife Conservation Center is in its infancy, so we appreciate the help of volunteers who donate their time to work on landscape development projects with us. The morning hours were cold and windy, and given that the upper and central part of the arboretum currently consists of wide open fields and valley slopes, we worried that the afternoon would be rather brisk when people showed up for the joint Earth Day / Arbor Day event. However, the winds died down and the sun warmed through the clouds enough to make the late afternoon tree planting exercise rather pleasant. While working, we talked about the ecology of hawks, owls, mice, worms, ants, spiders, salamanders, wetlands, native grasses, trees, and of course, future plans for developing the arboretum. No matter what the student’s major might be, it’s clear to me that people enjoy coming out to the arboretum and planting trees. I can almost see people think about the trees that they are planting and wonder what they will look like decades down the road when the arboretum begins to grow up. And of course, whenever you get a group of people working together, there’s always laughing, joking, and good conversation. And what will the trees that the students planted look like in just a few years? 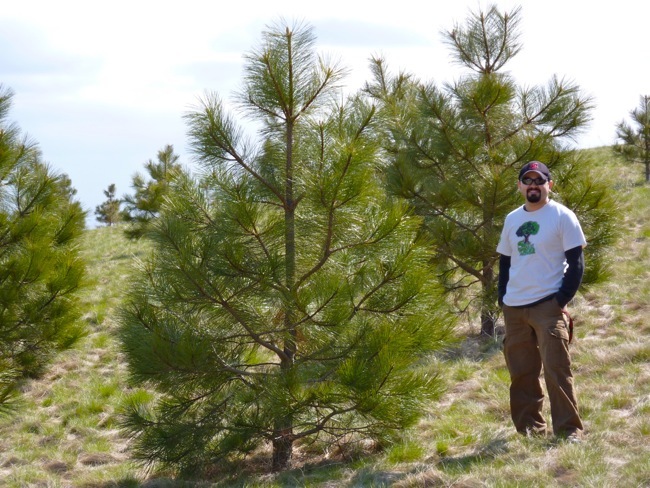 In the photo below, Erim Gomez, stands next to some ponderosa pine trees that were planted in the arboretum about seven years ago. With this perspective in mind, it is easy to imagine that the upper windswept slope of the arboretum will transformed into a respectable looking, western landscape in relatively short order thanks to the tough nature and rugged beauty of the ponderosa pines. 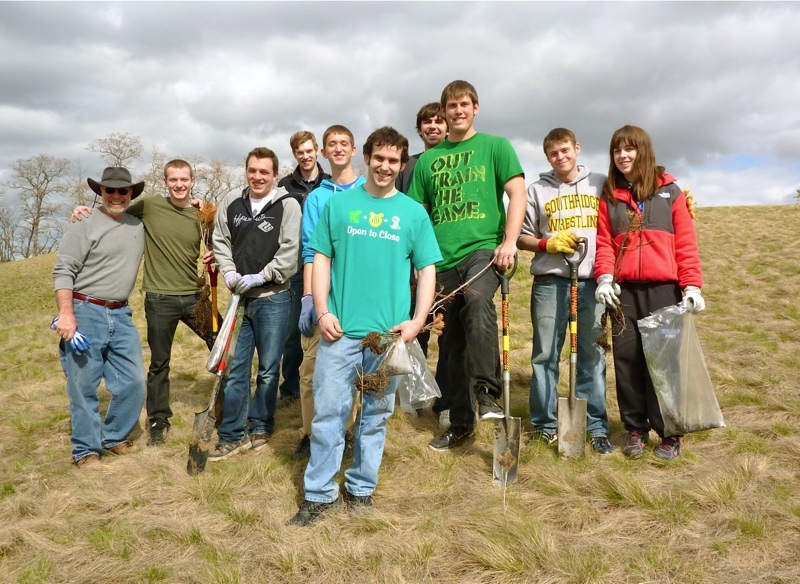 Thanks to the volunteers from Beta Theta Pi, today was another good day in the WSU Arboretum. Planting trees on the 2011 Earth Day / Arbor Day event in the WSU Arboretum.